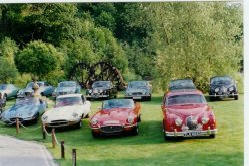 The Jaguar Drivers' Club Ltd is the original classic car club for Jaguar owners. It was formed in 1956 in London by a group of XK enthusiasts and has developed over the years to be one of the premier international clubs for Jaguar car supporters. From the headquarters in Luton, full-time staff administers the main functions of the Club. National & International events are organised each year. A monthly full-colour magazine, the Jaguar Driver, is sent to all main club members. For further details, see links. Regular contributions to the magazine are made by East Midlands members. The JDC has a unique structure, in that it is divided into Registers, and Areas. They operate independently to the Main club, but with close ties and support. The Registers provide a focus and expertise on specific marques (e.g. E Type register), whilst the Areas provide local support to geographical regions. For historic reasons the Areas are numbered, and the East Midlands Area is number 31. JDC member John Williams, of Nottingham, founded Area 31 in 1977. Subsequent chairmen who followed were Rob Saunders, and Gary Smith. The current chairman (and Area representative) is Rob Bradley, who has held this position since1993. Meeting venues have changed over the years. Early places included the White House (now the Otter) at Kegworth, the Dog & Duck at Shardlow, the Melbourne Arms at Melbourne, the Priest House at Kings Mills, the Ferrers Arms at Lount, and the John Thompson Inn at Ingleby. We currently meet at the historic Cooper Arms, Weston on Trent, where we have a dedicated room allocated for our use. 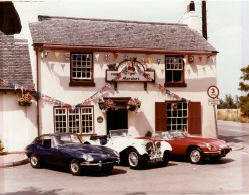 The pub has a good size car park and is in a lovely setting by the lake. Area 31 has a good-sized membership, with well-attended events and activities. We may not be the biggest in the UK, but we are one of the most active, produce an excellent monthly Newsletter, and do provide a significant contribution to the overall activities of the JDC.